ROSPA safe driving diploma from 1949. Homepage. This page: Leslie Hayes receives a certificate recognising his safe, accident-free, driving history. Royal Society for the Prevention of Accidents diploma. ROSPA (the Royal Society for the Prevention of Accidents) was established in 1916, as the London "Safety First" Council, in response to the alarming number of road traffic accidents that were occurring at the time - as a result of reduced street lighting, introduced as a measure during WW1. In 1917, a scheme that encouraged safe driving by professional drivers - again in London initially - came on stream, and continued to expand over the following years, eventually going nationwide. In 1920 the Council changed its name to The National "Safety First" Association, and again in 1941 to the Royal Society for the Prevention of Accidents. 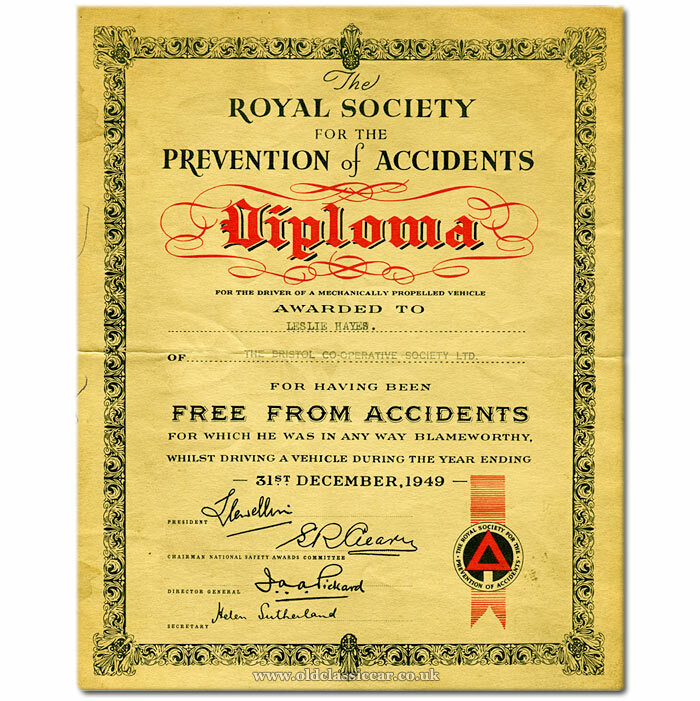 The diploma featured here was issued by ROSPA to a driver who operated a motor vehicle as part of their employment, in this instance with the Bristol Co-Operative Society Ltd (Co-Op). The recipient's name was a Mr Leslie Hayes. The diploma recognised that he had "... been free from accidents for which he was in any way blameworthy, whilst driving a vehicle during the year ending 31st December 1949". Alas, the type of vehicle(s) Mr Hayes successfully drove without incident, isn't recorded, chances are they were small/medium-sized commercial vehicles. Return to the Motoring Collectables section to find more old-car related items, including a 1954 publication issued by RoSPA titled Turn To Better Driving.